From the outside, the Udon Star Palace Hotel does not look like much of a place, or indeed a palace, with a somewhat outdated exterior, which could benefit from a coat of paint. However, this particular hotel more often than not receives very good reviews, indeed some of the best hotel reviews in Udon Thani. 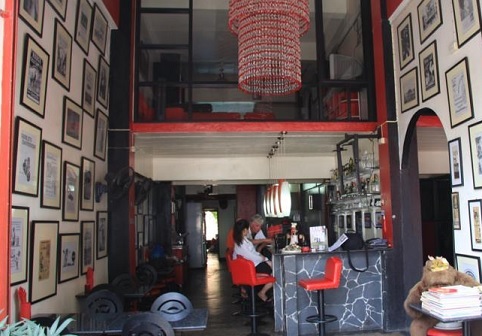 Located at the northern end of the main ferang beer bar and bar girl area's, it is ideally located, with a number of very good restaurants nearby as well as the Central Plaza shopping mall. It offers comfortable rooms with a seating area and the convenience of laundry and luggage storage services. There is free Wi-Fi available throughout the hotel too. Udon Thani's bus terminal and train station are just a 5 minute drive from Udon Star Palace, and the hotel provides free round trip transfers from Udon Thani Airport, some 15 minutes ride away. The modern rooms at this hotel are equipped with air conditioning, cable TV and a refrigerator, with shower facilities included in the en suite bathrooms. Rooms are from 800 baht per night, and that is for a King Deluxe room. Parking - Free! Free public parking is possible at a location nearby (reservation is not needed).